It's all over the Internet by now. 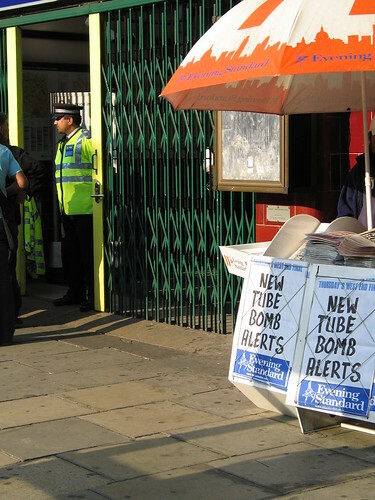 More explosions in the London tube. I was not planning on giving it any attention, until coming by this Flickr picture. The picture itself isn't what caught my attention, but the text with the picture is definately worth a mention. I think it gives a good insight on the feelings of everyone. At last weeks vigil one of the speakers (don't know who) read a poem he wrote and from that my favourite quote was 'Defiance a four letter word spelled with the middle finger' For the last two weeks Londoners have basically been giving the terrorists the finger -" F'U we ain't scared and we are not intimidated..." It felt like today they gave us the finger back... and I am not impressed.